1. 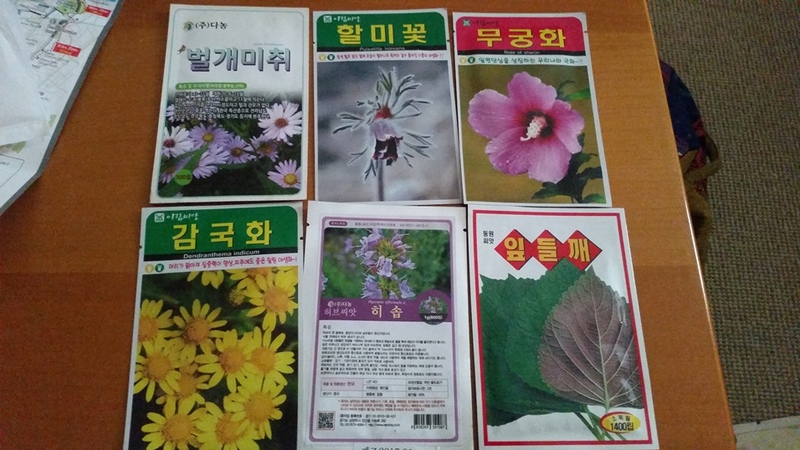 How long from sowing seeds until flowers are produced? 2. Which compost materials are best for germination? 3. Should the seeds be covered? in opaque or transparent material? 4. Which seedlings are most attractive to slugs? I'm thinking about the seeds I'm planting for Spring 2018. Every year I say to myself "fewer seeds!" and every year I go a bit mad. I bought some seeds in Korea, clockwise from top left, Aster koraiensis (saw lots of this in Korea), Pulsatilla Koreana, Rose of Sharon (national flower of Korea), perilla, hyssop, chrysanthemum (saw lots of this in Korea). I've used seed trays and pots but 20-4-2018 I got a few fibre pots and "growing pockets" which I haven't used for years. I'm curious how they will work. This gives me 74 pots for seeds plus the 2 40-cell seed trays that had the muscari, 154 in total, I think I have enough for this year. I have some shelves to keep the seedlings away from the slugs but it hasn't been wholly successful.The slugs and snails can slither up them. Nowhere is safe. 19-2-2018 With four cats, I like to have cat grass available for them on the windowsill. The last lot is done so I've started a new pot. I've put cling film over the pot to keep the seeds moist until they germinate. Cover the seeds or not? I'm not sure so some are on top and some are under the compost. I got so few cat grass plants from those Mr Fothergill's seeds, I'm trying these Franchi seeds. Some seeds want light, some don't. I'm not sure about cat grass so I've sprinkled the seeds on the compost and put plastic over to keep them moist. If they don't germinate in a reasonable time I will cover with compost. I stand corrected. Those small husky seeds are growing as well. What are they? same as the larger seeds or something else? There are about 30 of the large grass plants in the one pot and about 10 in this one. They can't be faulted on speed. These are large enough for cats to nibble in a few days - 4 days to be exact. 26-3-2018 I only ordered 1 pack of 25 from Peter Nyssen but when I saw them at Sainsbury's for only £2.50 I thought I'd try those as well. I soaked the corms overnight first. Last year I had a lot of fungus so I thought there was no hurry planting them. I don't think it does them any good to sit in soil for months before they start growing in the Spring. I put them on the top of some compost and then covered them with more compost. My first (of very few) ranunculus flowers today. They have been mercilessly eatern by slugs. I also found some ranunculus and anemone corms I hadn't planted yet the other day and promptly planted them, maybe June 1st? Of course ridiculously late but maybe they'll be some late flowers. The above ranunculus are not doing well. The slugs have really got to them. The slugs have been so active recently. Last year I planted the anemome and ranunculus so much earlier (beginning of February 2017) so although I had problems with rotting and fungus I did have a fabulous display of flowers (I'll have to check the exact dates) probably before the slugs got going. I investigated those late-planted ranunculus and anemone, same gooey rotting anemone corms as last year and larvae in the ranunculus and it sure can't be from too-early planting. They were from the same supplier as last year to replace those with the problems so I question the quality of those corms. 26-3-2018 I sowed 2 types of tomato seeds.The first row is Johnsons World Kitchen Chipano F1 only 10 seeds in the packet so 2 seeds per pot and Franchi Red Cherry in the next 3 rows, a few seeds per pot. I've covered them with plastic and put them on the windowsill inside as it's still quite cold outside. Seedlings I gave to my neighbour blooming this week, beginning of June. My first Blue Bedder just starting blooming today (8-6-2018). I'm seeing some buds and sadly more losses to slugs. Looks like I might get about 20 flowers - if I'm lucky and the slugs don't keep destroying them. I also noticed in the garden this morning (10-6-2018) a poppy seedling with the scabious in the pot on the left. I don't know which poppy it is. I still have that small Black Swan poppy seedling on the right. I don't know why that one hasn't gotten any bigger. 3 weeks later, I lost 3 more to the slugs although that one on the right is half-eaten. I guess I may have 4 plants? A verbascum and nasturtium have taken over this pot leaving the scabious crowded out but not sure what to do. It would be very difficult to separate the verbascum and scabious. The nastrutium will be finished soon and can be removed. I have 6 pots left with viola seedlings. Ideally I'd separate them out into their own pots but not sure I can. That tall one is a snapdragon that shouldn't be there. I put the largest seedling into this hanging basket beginning of September. I hope they'll still bloom this year, maybe they won't till next year but they are hardy so hope they'll be ok.
3 weeks later, the few (5) I have left are looking good. They should be able to bloom in those pots even though they are a bit small. I need to keep them on the top shelf away from the slugs, although that didn't wholly save them. The black pots at the front, left and right, are corn cockle. I sowed these in June 2017 so just over a year later, I have my first flower. Like many perennials they bloom the following year after sowing. end of May After the voracious slugs have eaten the chicory seedlings, I have one left and I found one self-seeded in this pot (not to be confused with the snapdragons) which may, after planting out - with slug protection - may be able to bloom this year. It's so large, it must have started growing last year. I had loads of seeds from the morning glory plants I had last year. I sowed them 2 or 3 weeks ago. Rather glow to germinate whereas in the past I thought they were quite fast. I don't know if I took a photo in between these 2 times. Above I hardly had any seedlings and below, 3 weeks later, I potted them into 3 round black plastic pots, not that large but they have bloomed the last 2 years in smallish pots like that. 3 are in my garden and 1 I put in my neighbour's on the other side of the fence. The purple flowers should grow along the top of the fence. The slugs kept eating every nepeta seedling as soon as it started growing so I moved the tray inside. There was nowhere else to put it outside - no matter now high off the ground the slugs still got to it. 3-7-2018 In spite of the slugs, I've managed to still have 10 plants, although the main plant in the pot bottom right was eaten, there was another small seedling so I hope that will eventually catch up. I am going to repot these soon. End of August, I am a glutton for punishment. I am trying to grow more catnip to sell the plants at a Christmas Fair for an animal charity. I put 3 seeds in each cell of this seed tray. Some cells have no seedlings yet. I'm worried about damping off indoors so have been putting them out during the day and bringing them in at night to keep them away from the slugs. I collected seed from my sea holly plants 2 years ago and planted the seeds last year. They germinated and grew well but the slugs love them so I put some in this trough rather than in the ground. I also had so many I wasn't sure what to do with them all. Now I wonder how long until they bloom. I have had small plants from the garden centre that never bloomed for 2 years or so, before the slugs got them. They obviously need some time to establish but I don't know how long. A couple weeks later, the sea holly has the tall flowering stems emerging from the centre of 3 of the plants in the trough. This hasn't happened with all of them. I guess the conditions were right? Now I'm more confused than ever. This small sea holly has a flower stem shooting up - why? Most of the small ones still in small pots like this don't have that. I still don't know what makes them develop like this. I planted these seeds last year and as small plants transplanted them to this trough. I wasn't sure how they would do as I'd never grown them from seed before. They have flower buds today (28-5-2018) so looking forward to lanterns later in the year. (plantain self-seeding in the middle there, now removed). Lanterns looking great September. So yes they can be grown from collected seed and yes, they can grow in a pot and produced lanterns. Next morning, 5 have been eaten by slugs; I thought that tray was too large and awkward to bring inside, I have now placed the remaining seedlings into 2 smaller trays and added some cleome seedlings from the nepeta tray. Even though I have been collecting slugs a number of evenings, seedlings are not safe! I put the 4 best remaining cleome seedlings into this pot which I put in the front of the house in one of the sunniest spots I have: the doorstep - so needs to be a pot. I must be a glutton for punishment but I've planted the next set of seeds. These are to bloom next year. I have no compost left so I'm reusing the compost from the tulip troughs. I'll start feeding the seedlings early as they won't be getting much from spent compost. Just 3 pots of Rose of Sharon as they can be sizeable shrubs and I don't imagine I'll need many. I'm melancholy about the melancholy thistle seedlings. The slugs have gotten to them. Bottom row looks pretty serious. Not sure they'll recover. Worst part is I don't know where to put them to save them from the slugs - except inside. I'd never seen winter purslane but had heard of it as an edible flower. That's why I grew it but the flowers are tiny. I sowed some seeds in August, for flowers next year. I managed to drop the seed tray and the contents of some cells spilled out. Maybe I should add more compost and seeds. First 2 columns on the left, Self-Heal, next 2 columns Bugle (I think), then Pansy Beaconsfield (was actually looking for viola seeds but closest I could find), next 2 columns Valerian. I've heard cats like Valerian so wanted to try it. I collected the seed from this year's delphinium flowers and thought I'd do a late summer sowing. I have a few seedlings - of course some aren't delphiniums (I see a poppy) and the slugs ate some already but I don't have too much room for large plants so if I get even 3 plants from this it would be fantastic.